Brewers Two Pack ~ The Bucky Channel - The World of Sports from Wisconsin's Perspective. Since I missed yesterday's Crew match up, today you get a Brewer Two pack. The Crew looked good offensively in both match ups, as they tied San Diego 10-10 yesterday and won 5-1 versus Kansas City tonight. In yesterday's game, Jeff Suppan decided to stink up the joint again. Sup gave up 5 earned runs on 6 hits in 3 innings pitched. Then Chris Narveson later in the game gave up 5 runs, 4 earned on his own. Carlos Villanueva and Todd Coffee each pitched well however. The bats were definitely alive though, as Corey Hart, Prince Fielder and Jason Kendall all hit home runs. Craig Counsell added a triple. TBC player of the game will go to Corey Hart for his 1-3, HR and 3 RBI performance. 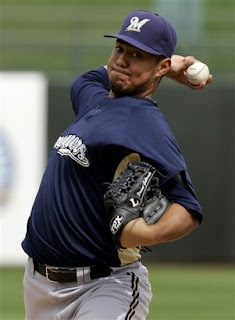 In today's game, Yovani Gallardo looked to avenge his poor outing last time he pitched and tossed 4 scoreless innings and struck out 5. That's more like it YoGo. Hoffman came in and pitched a scoreless inning as well. As for the bats Prince Fielder and Rickie Weeks both hit home runs. Prince was 2-3 with 3 RBI's so we'll go ahead and give him the player of the game award. Alcides Escobar all racked up a stolen base. On the injury front, it looks as if CF Mike Cameron will be out a few days with an intercostal muscle pull. I had to look it up, the intercostal muscle is one along the rib cage under your arm pit. Okay. Bill Hall is healing up and looks to in the lineup tomorrow. A big year from Bill Hall would be awesome. Others, Braden Looper is progressing, Rivera should be back sometime next week from a hammy injury and TGJ is still a 4th OF in the majors at best. Milwaukee gets the Dodgers tomorrow at 3:05 pm. Greinke couldn't believe that Prince hit that homer. He said it's the best curveball that he's ever had hit out of the park. When he later saw Prince in passing he asked the big guy how he managed to park the ball in the cheap seats. Prince explained that he just got lucky.